For decades, Watch Tower Park was a destination for folks all over the Quad Cities. In 1891 when several local railways merged to form the Tri City Railway, the formerly quiet landscape was soon transformed into a busy amusement park. Expanding this attraction was a shrewd business decision and the hundreds of passengers who paid fares to visit here on busy summer days ensured railway prosperity. An important feature of that early park was a new “Inn,” a towered Victorian style house, that supplanted an earlier open pavilion. Containing a restaurant and ballroom, it survived only four years before burning on July 3, 1896. 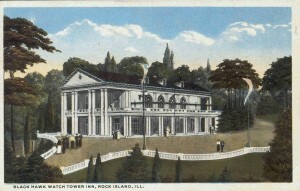 It was quickly replaced by a second Inn, as viewed from the southwest, on one of today’s postcards shown on the featured postcard. 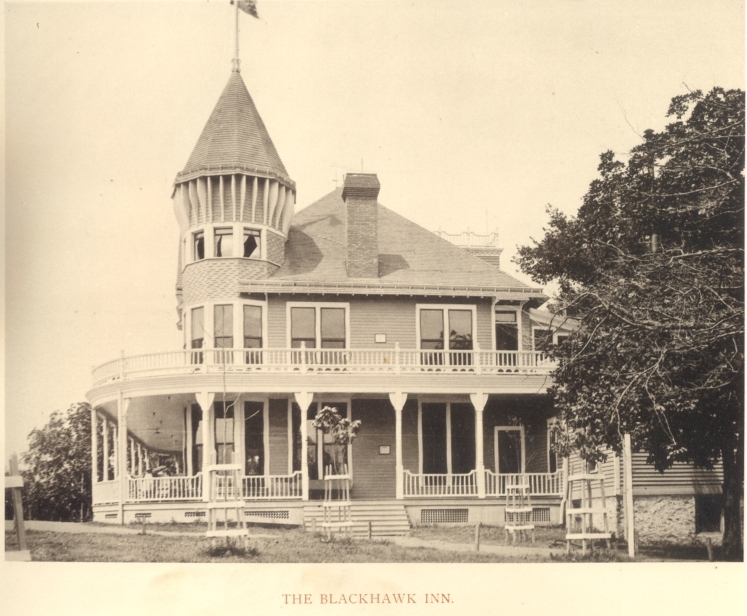 This second Inn that crowned the hilltop above the Rock River was the design of local architect Edward S. Hammatt. It was built in early 1897 by John Volk, who had worked with Mr. Hammatt on many other Rock Island buildings, including several schools. 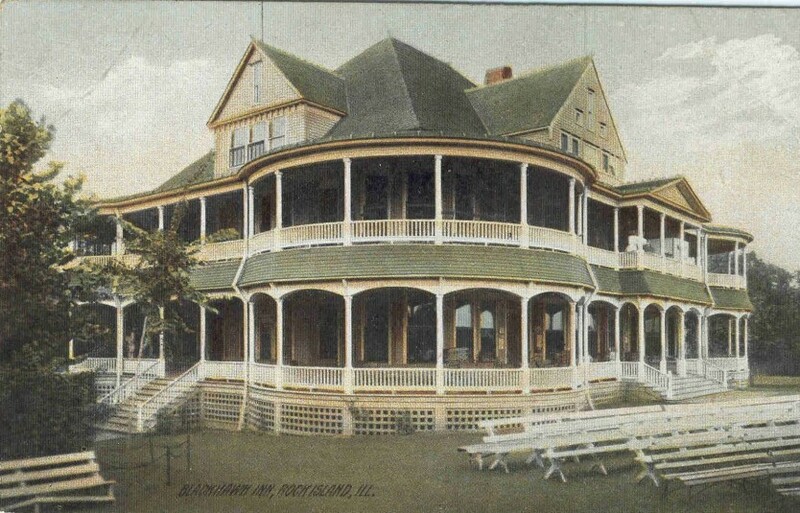 Three stories high and encircled with wide porches that looped around the corners on two levels, the Inn contained every amenity needed by patrons of the amusement park. Described as Colonial Revival in style, it was said to be of “pine wood” because its interior surfaces were completely covered in varnished wood rather than the more common (and fire resistant) plaster. The first floor contained an ice cream parlor, dining room, kitchen and office. In 1914, the north porch was expanded and screened so it could be used as a summer dining room. The second floor had a ballroom and, later, a movie theatre operated by a concessionaire. Guest apartments were available, too. This is believed to be the only Inn that actually offered public lodging. The third floor attic level served as quarters for the female staff. A beautiful July Friday in 1915 saw a group of over 300 people enjoying a picnic and outing here. Two days later, the Inn lay in ruins. A fire, which had smoldered undetected for hours, broke through the roof near noon on Sunday and an hour late had consumed everything, despite the best efforts of two fire companies. The intensity was so great that paint was blistered on the band shell 100 feet to the west. Losses were estimated at $23,000 with $19,000 attributed to the building. Movie and other equipment as well as personal effects accounted for the difference. The fire destroyed displays of treasured Indian relics as well as an oil painting of “Old Black Hawk,” in the ballroom. Yet it could have been worse. Had the fire exploded at night, those living on the third story would have died when the only stairway was quickly engulfed in flames. Immediately following the fire, plans were made to build a temporary shelter for meals, ice cream and, perhaps, dancing for that year. In early 1916, the contract was let to build the third Inn. The Argus suggested building the Inn closer to the river so that the veranda would easily overlook the bluff and river and that advice was followed. The third Inn was located south and east of the second one, approximately in the open space south of today’s Inn. No architect was mentioned in publicity, but it may have been the work of Olof Cervin. Architectural renderings of the building show a remarkable similarity in artistic style to a drawing of what is now Circa 21, which was the work of Cervin’s firm. The contractor, the Henry W. Horst Company, began the $60,000 construction project in April by clearing the rubble of the burned Inn. Amazingly, the new Inn was ready for occupancy in mid June of that year. Of “Colonial origin,” it was two stories tall with frame construction clad in white-painted stucco. Moreover it was designed to be fireproof – a wise decision based on previous Inn history. 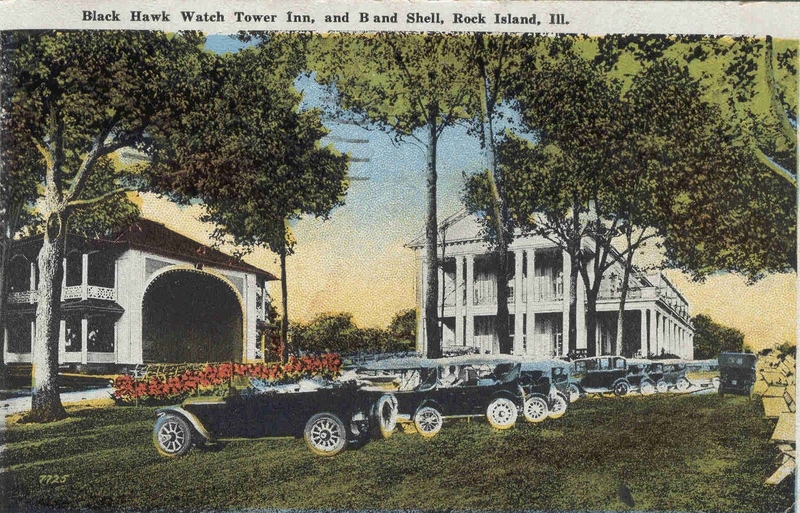 The rectangular Inn, called one of the “prettiest and most substantial of any summer resort in the midwest,” was 92 x 54 feet with 19 foot porches on all sides of both levels. 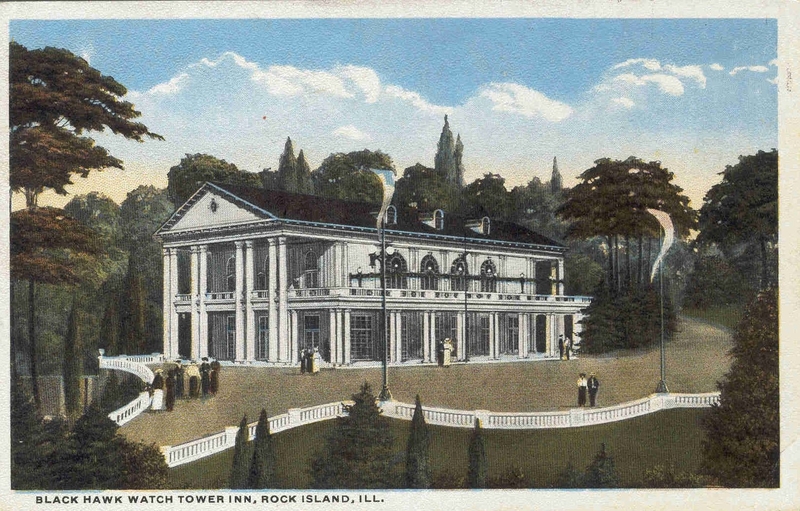 The two postcard views of the third Inn show the eight two-story columns that supported the porches at either ends. Shorter columns on the sides created open second story verandas. 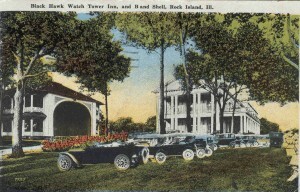 One postcard also identifies a band shell, presumably the same one that was blistered in the earlier fire. Like its predecessor, this Inn had a large public dining room, as well as private dining rooms and a kitchen on the first floor, while the second floor was occupied by a 65 x 52 foot ballroom with a stage at the west end. The Inn also held quarters for the staff at the mezzanine level. The grand opening took place on June 15, 1916. At a cost of only $5 a couple, dining and dancing were provided. The dinner-dance added to what was already was a festive year in Rock Island, with many events offered in celebration of the Fort Armstrong Centennial, the anniversary of the building of the fort on Arsenal Island. The old amusement park died a slow death as patronage declined. A presage of that decline is seen in the row of autos parked in the foreground of one postcard. As cars became more common, no longer were people tied to streetcar destinations. An outing at the park was only one of many possibilities. This third and last Inn was demolished in 1936, to be replaced by the building which stands at the site today, now known as Blackhawk State Historic Site. This article, by Diane Oestreich, is slightly modified from the original that appeared in the Rock Island Argus and Moline Dispatch on December 2, 2007.